There is a long list of indicators that you are a foodie. Talking about the next meal while eating a current meal is a classic. Roaming around the cookbook section of a bookstore as a favorite hobby is another. Then there is the common cocktail conversation centered around the best meal anyone has ever had. Facebook photos is the ultimate foodie confession when you look through someone's albums and see more pictures of food than family. True? Then there are those of us who blog about it, nearly daily. Or how about creating a whole new company all about right-sized eating? Yep, I'm hooked. I am fascinated by it and how our daily lives evolve around our edible experiences. I had no idea, however, how extreme a foodie I was until we recently sold our condo. There is nothing more telling than when you have to pack up all your possessions. I think my spices alone took up three boxes. My spices tell stories about my life. They can tell you about a special dinner party or a particular dish I tried out on my family. It is amazing how many spices I have been given from people's travels in distant lands. I can't imagine not keeping them all with me. But how many spices do you need, really? If they are one of a kind? All of them. Now you are really going to chuckle. Not only did I pack up all of my kitchen but I brought a majority of it with me to a small cabin we are living in for the next couple of months while we wait for our new home to be ready. My husband had to bring in extra book shelves for me to have space for all my grains, spices, vinegars, oils, teas and baking supplies. Crazy foodie behavior, right? 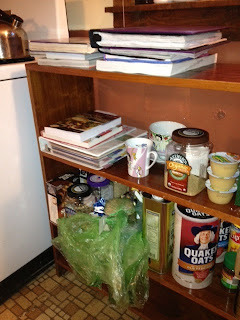 I couldn't be happier as I look up from my computer to see my make shift kitchen cabinets brimming with what I consider my "basic" kitchen supplies. Ahhh, it is a good life being a foodie.